Richard Downing has written some very interesting histories about Hillside and Ventnor. You can find an overview of the different histories here all linked to full stories. 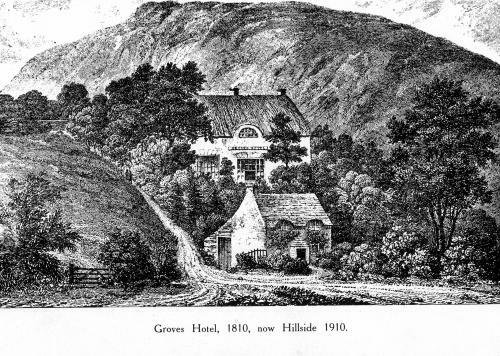 The history of Hillside begins in the area to the west known as Steephill where Mrs. Mary Groves owned and kept an inn. When her lease expired in 1801, the landowner, Lord Dysart, provided her with a new building at the foot of St. Boniface Down which became known as the New Inn and then Groves Hotel. scattered houses whose inhabitants were fishermen or connected with some seafaring occupation. on the southern coast of the Island. An entry of 1795 calls Ventnor a small village between Steephill and Bonchurch and refers to the cove with its cascade and fine scenery. A stream which drove the wheel of the local mill flowed into the cascade. The village was noted for its catches of crab and lobster which supplied the London market. Winfrith, a Christian missionary from Wessex, was based at a Benedictine monastery in Hampshire when he is reputed to have visited Bonchurch on the Isle of Wight where he preached from Pulpit Rock. That would be about 710AD. A few years later Winfrith set out on a missionary expedition to Frisia, intending to convert the inhabitants to Christianity by preaching to them in Anglo-Saxon English which was similar to Old Frisian. But the Frisians were at war, making his task impossible, so he returned home. Two years later he visited Rome to ask Pope Gregory II for his blessing to continue as a missionary. The Pope gave him the new name Boniface whereupon he embarked on 35 years of missionary work in various parts of what is now Germany. He went on to found many new churches and monasteries and eventually became Archbishop of all Germany. Boniface was constantly traveling:his journeys and letters show his energy and spirituality. Many of his fellow-workers also came from Anglo-Saxon England. The most famous incident that occurred during the French invasion in July 1545 was the sinking of the Mary Rose during the Battle of the Solent which was witnessed by King Henry VIII from Southsea Castle. At the end of his long reign, King Henry VIII was at war with France and in 1544 the English Army had captured Boulogne. The French planned a counter-attack hoping to occupy Portsmouth or Southampton. Failing that, they would seize and fortify a part of the Isle of Wight.